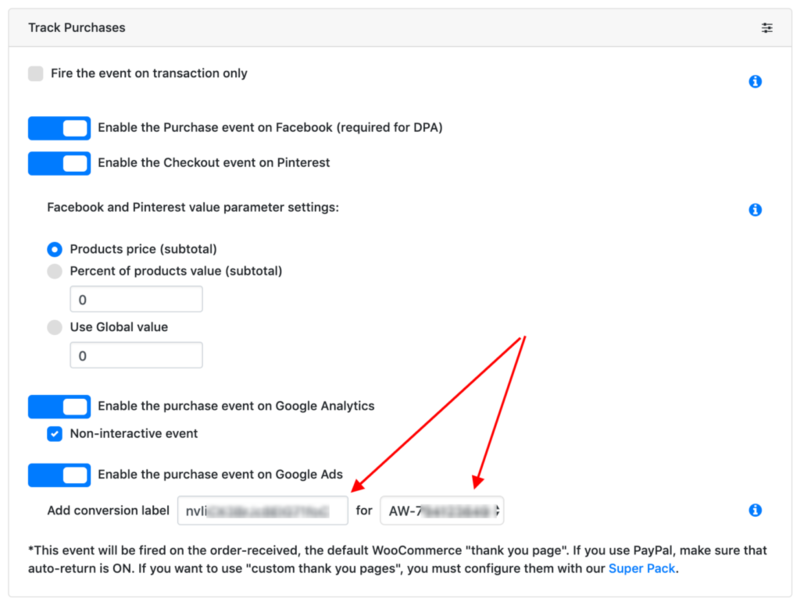 You can transform any standard WooCommerce event into a Google Ads conversion by adding the “conversion label”. For this to work you need the Google Ads tag installed by PixelYourSite Pro and you need Enable WooCommerce set-up to be turned ON. Open PixelYourSite Pro WooCommerce tab and look for “Track Purchases”. Click to expand and look for the “conversion label” field. “Enable the purchase event on Google Ads” must be turned ON. Paste the conversion label you’ve generated inside your Google Ads account and save the new settings. If you have multiple Google Ads tags installed on your website you have to select the send the conversion to the same Tag ID (conversion) where it was created. Click on the large blue PLUSS button to add a new conversion. Select “Website” and configure your conversion. Google will create the Conversion for you. You now need its “label” to add it inside PixelYourSite Pro. Paste the conversion label in the special field of PixelYourSite Pro Purchase event as described in the first part of this page.